Legendary hotelier Jeff Klein has opened 850, a new boutique hotel situated in the heart of West Hollywood in Los Angeles, USA. 850 is located in the heart of the city of angels with 23 rooms, a communal living room, large rooftop terrace and a modern pantry where guests can enjoy meals by chefs from across the city. As it happens, 850 is in the cultural and geographical heart of West Hollywood. 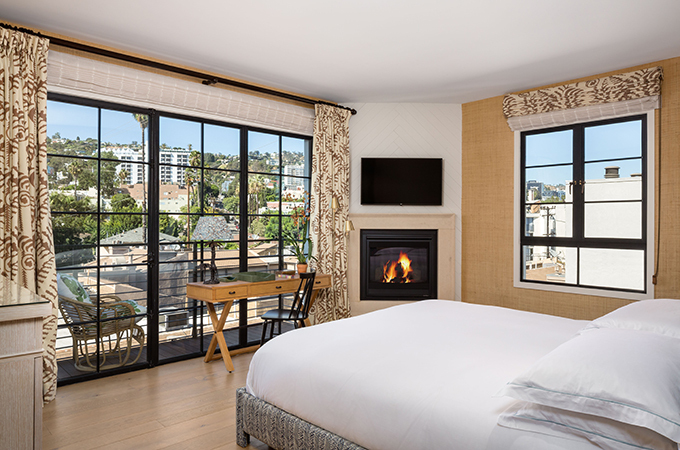 The hotel’s façade is in the style of a historical bungalow, tucked away in a residential neighbourhood surrounded by must-see hotspots – including Sunset Boulevard, Melrose Avenue and Runyon Canyon – coffee shops and restaurants. This chic home offers a sanctuary from the hectic city. Inspired by his travels around Sicily, Klein’s aim is to create an intimate space in a great Hollywood location. 850 feels more like a chic European hotel and features interiors by British designer Rita Konig – including 23 beautifully appointed rooms – who brought her bold and collective style to West Hollywood. Interiors features distinct layers of pretty pastel colours and textures which have been used to create a relaxed patchwork of old and new and will introduce an elegant, lived-in timelessness to the LA hotel scene. All spaces are for hotel guests only, allowing them to connect on a more personal level while enjoying a communal experience. The intimacy of the hotel creates a unique communal experience among guests. The lobby-lounge, which sits at the heart of the hotel, doubles up as a bar serving an extensive menu of premium wines, spirits and cocktails, carefully curated by Klein and his team. The living area is home to a large cosy fireplace, antique leather armchairs and vibrant fabrics, while the communal residential-style kitchen is complete with a marble sub-zero fridge where complimentary breakfast is served. A series of revolving chefs from across LA have been invited to cook dinner for guests showcasing local delicacies and international cuisine. The beautiful rooftop terrace offers spectacular views of the city which guests can enjoy, accompanied by wine and mezze. Rates at 850 start from Dh1,451 ($395) on a room-only basis.